American retailers have been lobbying the great and good to implement PIN for card transactions. We have chip and PIN, so we think this is nothing new. But note this is not what they are asking for. When it comes to chip and PIN, they are not that bothered about chip (after all, all transactions are online). PIN is the most secure authentication technology currently available, and retailers should have the option to require PIN on credit and debit card transactions—the same protection provided at ATMs. So, given a choice between chip and PIN, they choose PIN. And a lot of them already have PIN pads because of PIN debit. So: merchants want PIN, and they have PIN pads, so no problem and everyone’s happy. Well… not quite. Many of the America card issuers have decided to issue chip and signature cards. From the retailers’ perspective, this looks like the worst of both worlds. They have to buy a chip card reader but they still don’t get PINs. And, so far as the retailers are concerned, it is because banks want to maximise revenue. A 2012 Food Marketing Institute report mapped out the revenue losses for signature-based transactions versus PIN-based transactions and found significant differences in profit. Per $1,000 in transactions, banks receive $14.20 in revenue from signatures, versus $6.70 from PINs—a difference of $7.50. The upshot of all of this is that as of today the US banks are (bizarrely, to foreign viewers) issuing chip and signature cards, US customers are continuing to swipe (they don’t care about the liability shift) and US retailers are getting annoyed. Apart from anything else, their costs for chargebacks and for managing chargebacks are climbing. You understand why this, I assume. It’s because before 1st October, if you spotted a $3.95 charge at Starbucks on your statement and you knew that you couldn’t possibly have made that transaction, then you would call up your issuer and complain and they would just eat the charge because it would have been more trouble than it’s worth to go back to Starbucks, pull the receipt, check the signature if there was one etc etc. However, after 1st October, if you spot a bogus $3.95 charge on your account and call up, the issuer will check the transaction codes and, if you had a chip card but it was swiped by a merchant who didn’t have (or didn’t use) a chip reader, then the $3.95 is charged back to the merchant. The net result is — entirely as expected and as it should be — that merchants see big increases in card-present chargebacks as previously hidden magnetic stripe fraud is revealed and transferred to them. 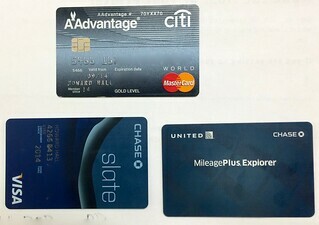 A US colleague’s new credit cards. Not one is chip and PIN. The 47-page complaint, filed Tuesday in U.S. District Court for the Northern District of California, comes just over five months after the liability shift took effect Oct. 1… The merchants, which are not yet ready for EMV, seek treble damages for what they claim are chargebacks and chargeback fees that have totalled more than $10,000 stemming from 88 chargebacks from Oct. 1 through Feb. 15. In the same period a year earlier, the merchants incurred only four chargebacks, the complaint says. The entire class of such merchants total hundreds of thousands of members that have incurred “billions of dollars” in chargebacks and fees since the shift took effect, according to the suit. This might indicate that US merchants have completely missed the lessons from the EMV migrations that have occurred in every other region in the world over the last decade, but more than that the muddle suggests to me that the card networks hold over the retail point-of-sale may not be a firm as it seems. If you look at what’s going on with ApplePay and ChasePay, WalmartPay and wallets, it’s clear that not only are there competitors closing in on them, but that there are stakeholders who are heavily motivated to find customer-friendly alternatives. Bitcoin isn’t one, but there are plenty of other candidates, especially in Europe where the regulation is about to change, to favour push payments and in-app payments (because they will have API access to payment accounts). It’s clear that the pressure is building on what previously seemed to be the unshakeable redoubt of the four party payment model. If the networks’ grip on the retail point-of-sale is loosening then there really is a payments revolution underway. Right now the increase in EMV chargebacks is simply revealing fraud costs that were previously hidden. As EMV does what it says it does and blocks face to face fraud then the fraudsters will move elsewhere: and that’s when we will see whether the nascent competition to card networks have properly thought through their own risk models!